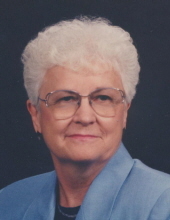 MONONA-Margaret L. Schwartz-Fernholz, age 93, of Monona, passed away on Tuesday, April 9, 2019, at Agrace HospiceCare. She was born on April 17, 1926, in Montello, the daughter of Peter and Mary (Kanke) Nickolai. Margaret graduated from Montello High School in 1944. She married Myron Schwartz on June 26, 1947, in Montello. Margaret married Gerald Fernholz on March 21, 1993, in Monona. Margaret was a homemaker and a member of St. Ann's Society and the Catholic Order of Foresters. She loved gardening, canning, sewing, knitting, crocheting, and doing ceramics. Margaret was an avid golfer, and she enjoyed bowling and taking long walks through Monona. Margaret is survived by her children, Kathleen (Robert ) Kaul, Patricia (Tom ) Bretl, Cindy (Greg) Altenberger, William Schwartz and Charles (Catherine) Schwartz; step-daughter, Ruth Fernholz (Cohen); daughter-in-law, Barbara Schwartz; grandchildren, Dierdre Disch, Erin Disch, Brooke (Nick) Duckart, Logan Kaul, Kristen (David) Braun, Adrienne (Aaron) Kostichka, Alex (Whitney) Bretl, Sean (Katie) Schwartz, Amanda (Kenneth) Hughes, Chris Schwartz, Matt (Holly) Altenberger, Scott (Michelle) Altenberger, Michelle (Luis) Acosta, Joey (Trina) Schwartz, Alicia Schwartz, Daniel Schwartz and Laura Schwartz; step-grandchildren, Jen Fernholz Morris (Jason) and Kelly Fernholz Anderson (Bret); 24 great-grandchildren; five great-step-grandchildren; and sisters, Agnes Connors and Madeline Engelhart. She was preceded in death by her parents; two husbands, Myron Schwartz and Gerald Fernholz; son, Michael Schwartz; two infant sons, Kenneth Schwartz and Ronald Schwartz; and two brothers, Father Clarence and Father Arthur Nickolai. A Mass of Christian Burial will be held at IMMACULATE HEART OF MARY CATHOLIC CHURCH, 5101 Schofield St., Monona, at 11 a.m. on Tuesday, April 16, 2019. Burial will be held at Roselawn Memorial Park, Monona, with a luncheon to follow immediately at the church in Marion Hall. A visitation will be held at the church from 9 a.m. until the time of the Mass on Tuesday. Memorials may be gifted in Margaret's name to Immaculate Heart of Mary Catholic Church or Agrace HospiceCare. Online condolences may be made at www.gundersonfh.com. "Email Address" would like to share the life celebration of Margaret L. Schwartz-Fernholz. Click on the "link" to go to share a favorite memory or leave a condolence message for the family.